Report on the 3rd annual In Pursuit of Balance (IPOB) Tasting, on Monday February 4th, 2013, at Bluxome Street Winery in San Francisco. The event showcases current releases of Chardonnay and Pinot Noir from California producers. In Pursuit of Balance San Francisco events included two seminars preceding the afternoon trade/media tasting. This was the first year that IPOB has presented seminars. I attended the trade/media portion of the tasting in the afternoon of February 4th; there was a public tasting in the evening. A tasting event in Los Angeles followed on Wednesday February 6th, the first IPOB tasting there. The tasting notes that are part of this report are all from the Monday afternoon trade/media tasting. In Pursuit of Balance was founded by Rajat Parr of Michael Mina Restaurants and Sandhi Wines, and Jasmine Hirsch of Hirsch Vineyards. The stated goal of the organization is “to celebrate wineries who are striving to produce balanced Pinot Noir and Chardonnay in California,” and the purpose of the tasting event is “to promote dialogue around the meaning and relevance of balance in California Pinot Noir and Chardonnay.” A more in-depth statement of the group’s beliefs can be found in their “Manifesto of Balance” on the IPOB website. There were 28 producers pouring their wines at this year’s IPOB event. A large percentage of the bottlings were from Sonoma Coast fruit sources, with Santa Barbara County also being well-represented. Wines from Anderson Valley, Russian River Valley, and Santa Cruz Mountains were also poured, though in smaller numbers, and there was a smattering of wines from other Central Coast locations, and from two or three other growing areas as well. As has been the case with the past IPOB tastings, this was an impressive group of wineries participating, with a good mix of established Chardonnay and Pinot producers as well as some promising newer vintners. There are certainly many others whose wines and winemaking philosophy would fit into the IPOB group, but I imagine that the event organizers have tried not to have it grow too large, at least at this point. 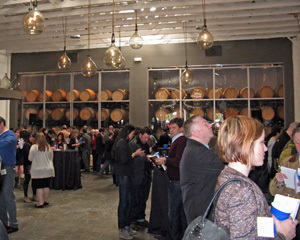 This was the first year that the event was held at the Bluxome Street Winery. The space worked nicely for the event, and there was plenty of room to move between tables without having to fight through a crowd of tasters. The seminars ran a bit long, but the event staff did a good job of quickly breaking down the seminar table setup and getting everything re-set for the afternoon tasting. Overall the event was well-organized and ran quite smoothly. While I was not able to attend the two IPOB seminars – they were completely sold out – video recordings were made of both of them, and they are available for viewing through a link on the IPOB website. I listened to audio of both seminars, and my notes on them are based on that. The first seminar was titled “Relevance and Purpose in California Chardonnay.” Moderated by Jon Bonné of the San Francisco Chronicle, it featured panelists Gavin Chanin of Chanin Wine Company, Matt Licklider of Lioco; Rajat Parr of Sandhi, and Bob Varner of Varner Wine. Anthony Filiberti of Knez also joined in the discussion. The introduction pointed toward a movement among some Chardonnay producers to go beyond the initial reactions to “big” California Chardonnays to work with concrete, neutral oak, and larger oak cooperage, in addition to stainless steel, for fermentation and aging. The panelists talked about their efforts to show the terroir of their vineyard sites through both the growing practices and winemaking choices. It was mentioned that Chardonnay is a perfect grape variety to achieve this since it tends to lack much distinct varietal character on its own. Several panelists mentioned their search for older vines to best display the vineyard character in their wines. An interesting point was brought up late in the seminar about whether it is possible to replicate this approach at a larger scale, since all of the wineries currently doing this are quite small. Some believed that this was possible but acknowledged that it may be difficult. Ultimately, I felt that this seminar may have lacked enough diversity among the panelists to generate much lively interaction. Although there was certainly some interesting information presented, I think the seminar would have benefited by including a panelist or two with a somewhat different philosophy and/or winemaking methodology. Including a winemaker who tends to use a higher percentage of new oak on Chardonnay might have produced some interesting discussion, for example – there were certainly several vintners participating at IPOB who could have brought that point of view to the seminar. And the “us-against-them” theme that was brought up more than once – with the “them” being producers of big Rombauer-style Chards – seemed forced, when so much California Chardonnay falls into neither the IPOB nor Rombauer styles. I thought the second seminar, “Exploring Whole Cluster Fermentation in Pinot Noir,” was more rewarding. This was moderated by wine writer Jordan Mackay, who co-authored the book Secrets of the Sommeliers with Rajat Parr. Panelists were Jim Clendenen of Au Bon Climat, Ehren Jordan of Failla, and Jamie Kutch of Kutch Wines. The use of whole clusters in the fermentation of Pinot Noir has remained a controversial method over the years, with strong opinions on both sides. The panelists did a good job of pointing out advantages (spice and floral aromas, added texture) as well as potential pitfalls (green, herbaceous aromas and flavors, more care and monitoring often needed during fermentations). A typical problem in the vineyard faced by those looking to do whole-cluster fermentations is that grape ripeness and stem ripeness may not come at the same time. Ehren pointed out that cooler sites may be better-suited to the use of whole clusters since sugars tend to accumulate more slowly late in the growing season, allowing development of the stems to catch up. For similar reasons, Jim noted that warmer vintages may not work as well with whole clusters and that their use is best avoided during wetter harvest seasons. Ehren stressed that he only makes decisions on using whole clusters after the fruit is picked from each vineyard – whether or not to include them is dependent on the vineyard site and vintage. Jim added that even the most highly-regarded vineyards are not well-suited to the use of whole clusters every year. There was a question about whether clone and rootstock can affect decisions on using whole clusters, and Jim thought that the clone didn’t make much difference, but that devigorating rootstocks can be beneficial. Ehren said that he felt there was not much that can be done in the farming of the vineyard to increase lignification of stems. But everyone agreed that the color of the stems is not critical in the decision on whether to use them. Jamie pointed out that he looks for the sap to no longer be carried through the stems – if the sap is still running, you’re more likely to get greenness in the wine but the sap can often stop running while the stems are still bright green in color. Jim mentioned that he had originally used all 100% whole-cluster fermentations at Au Bon Climat but learned quickly that it didn’t always work well. He noted (and the others agreed) that fermentations take longer with whole clusters due to the slower release of sugars from the individual berries. It was also pointed out that there is more of a carbonic maceration character in whole-cluster fermentations since more whole berries stay intact until the wine is pressed. Jamie talked about the need to be gentler during fermentation so as to avoid extracting too much of a green quality from the stems. A question was raised as to whether this type of fermentation can affect barrel decisions, and the consensus was that it can handle a larger percentage of new oak and it benefits from longer barrel-aging. One issue related to oak is that the wine from whole-cluster fermentations will have more sugar left in it when pressed, due to more unbroken and not fully-fermented berries, so it will finish primary fermentation in the barrel – this was felt to allow for better integration of the oak in the wine. One more issue was how stem inclusion affects wine color – Jim pointed out that with Pinot being naturally low in both color and tannin, the increased tannins gained from the stems can help with both the texture of the wine as well as to stabilize color by binding to anthocyanins. But the greater pH shift in the wine (stems will cause the pH to rise more than in destemmed fermentations) can be an issue that affects color too, and may need careful monitoring if it is excessive. Overall, this was a very informative seminar, and well-moderated to help bring forth discussion on many topics from several points of view. It’s difficult to talk about this tasting without a brief discussion of IPOB itself and how the event is organized. The IPOB tasting continues to be controversial in some quarters. Unlike wine events that are based on geographical and/or varietal criteria (i.e. Santa Barbara County Vintners' Festival or World of Pinot Noir, just to name two), this one is subject to invitation/exclusion based on more subjective criteria. Participants are selected each year by a committee that includes winemakers, wine writers, and sommeliers, and it’s my understanding that any winery is welcome to submit their wines for consideration. Some wineries that have poured in the past may not be invited to pour at future events, though I’ve also heard that the core group of wineries that have been with IPOB from the start will continue to be part of the group. The fact that a small group of people selects the participants to be invited is a source of criticism by some in the wine business, though it’s understandable that the IPOB organizers do not want to dilute the intended focus of their event, which is to showcase wines made in their preferred range of styles. Another subject that has been discussed in relation to this event is its limitation to Chardonnay and Pinot Noir. One probable reason for this limitation is that those are the only varieties made by Rajat Parr’s Sandhi label and by Jasmine Hirsch’s Hirsch label – so I’m sure there’s a feeling of greater familiarity with these varieties on the part of the two IPOB founders. No doubt there’s an element of self-promotion involved too, but there’s no reason why there shouldn’t be. Another reason is that many feel that Chardonnay and Pinot can display the terroir of their vineyard sources better than most other varieties, and this seems to be a major goal of many vintners in the IPOB group. I did appreciate the narrower varietal focus at this tasting – it facilitated direct comparisons between wines and producers more easily than if more varieties had been included. Of course there’s also the definition of balance in wine, which is subjective by its very nature. One essay on the IPOB website states: “Loosely speaking, a wine is in balance when its diverse components – fruit, acidity, structure and alcohol – coexist in a manner such that should any one aspect overwhelm or be diminished, then the fundamental nature of the wine would be changed.” It’s never been my feeling that those in charge of the IPOB group are seeking to claim that the wines made by their producers (and other wines in a similar style) are the only ones that are balanced. And it seems clear that the event is more a gathering of like-minded vintners who make wines in a certain style rather than it is a broader look at balance in wine. I’d say that most of the wines I tasted at the event seemed balanced to me, though there were some that I thought were not, where certain components dominated others in the wine. Overly stemmy character from use of whole-cluster fermentation was an issue in some wines, for example – though I found this to be less of an issue than at last year’s tasting. But after all, the name of this event is “In Pursuit of Balance,” and I believe that this choice of words shows that the IPOB organizers understand that balance is still a goal to be attained rather than a fait accompli. But on to the wines themselves. As I found at last year’s event, going through so many excellent wines in a three-hour tasting was not easy. As I knew I would not be able to get to all of the producers who were pouring, I decided to skip many Sonoma Coast wineries, as good as I knew their wines would be, since most of them would be pouring their wines at other events I plan to attend in the coming months. I also limited tasting at two Santa Barbara County producers – Chanin and Tyler – that I’d visited in January, and I only sampled the wines there that I hadn’t tried at their wineries a few weeks earlier. I did make it to 20 of the 28 tables at IPOB. It was great to see some of California’s "legendary" vintners pouring their wines – Jim Clendenen, Adam Tolmach, Ehren Jordan, Jeffrey Patterson, and Josh Jensen among others. The opportunities to sample wines from some of the producers who poured at this year’s IPOB tasting are rare enough, let alone to have access to all of them at a single event. A few wineries that poured at last year’s event did not return this year, and there were some newcomers at this year’s tasting: Drew, Knez, LaRue, and Varner. Of these, Drew and Varner have been around for a number of years, while LaRue and Knez are relatively new producers. I made it to three of these four vintners’ tables, missing LaRue this time – though their 2010 Pinot was a favorite when I tasted it at another event last summer. As far as general impressions, a few come to mind immediately. One is that I was surprised that more Chardonnays made my list of favorites than Pinots. Over the years I’ve been a big fan of California Pinot Noir but not so much of Chardonnay. There were certainly a lot of excellent Chards at this year’s tasting, and I think that many of the Pinots – mostly from the 2010 and 2011 vintage – simply need more time to show their best. But one thing that struck me about the Pinots was how well-integrated the whole-cluster component was on nearly all the ones I tasted, and I felt this marked a contrast with last year. Even some high-percentage whole-cluster Pinots that I find can be rather hard and green in their youth (Calera and Native9 come to mind here but there are others as well) seemed remarkably non-stemmy to me. And a Pinot such as the Au Bon Climat Talley Rosemary bottling surprised me – I had no idea that it was made with 100% whole clusters until after the event. Several producers from whom I’ve come to expect somewhat bigger, fleshier wines produced more taut and quite interesting bottlings from the cooler 2010 and 2011 vintages. It will be interesting to see how their 2012 vintage wines will compare with these. Of wineries whose wines I had not tasted before, Knez and Soliste were both very good. Others I liked a lot were Au Bon Climat, Copain, Drew, Hirsch, Mt. Eden, and Ojai, but many others were close behind. As I found last year, there were so many top-notch wines poured at IPOB that I could easily have included more wines and producers among my favorites. And just as last year, this will undoubtedly be one of my top tasting events of the year – it’s rare that the quality level of wines at any tasting is so high across the board. Arnot-Roberts 2011 Chardonnay, Santa Cruz Mountains. From a dry-farmed vineyard five miles from the ocean near Aptos with 30+ year-old Wente clone Chardonnay, picked at 21 brix, aged seven months in neutral oak. Light straw color, featuring bright citrus aromas plus touches of pear and lemon zest. Zippy acidity on the palate and finish, still needing time to settle down. I’d tasted a barrel sample of this wine last year, and both times it had the most intense acidity of any wine at the tasting. Arnot-Roberts 2011 Chardonnay, Watson Ranch, Napa Valley. From vines planted in 1980 at an organic vineyard at the southern tip of Napa Valley near San Pablo Bay, with limestone below clay topsoil. Picked at 21.5 brix, aged seven months in neutral oak. Slightly deeper color than the first wine, with nectarine, green apple, and a leesy note. A rounder mouthfeel along with crisp acidity and a minerally component, this had a long, clean finish, nice. Arnot-Roberts 2011 Pinot Noir, Peter Martin Ray Vineyard, Santa Cruz Mountains. From the historic 1970s dry-farmed organic vines at 1,600-foot elevation on Mount Eden near Saratoga. 100% whole-cluster fermentation, aged in older barrels. Vibrant light garnet color, this showed cranberry and strawberry fruit, earth, and fresh herbs on the nose. Bright mouthfeel with a minerally note on the finish and fairly mild tannins. A promising young wine that will need some bottle age. Comments: The winery was founded by Duncan Arnot Meyers and Nathan Roberts in 2002. All wines go through native fermentations, and Chardonnays are whole-cluster pressed and fermented in stainless steel, then racked to neutral oak. 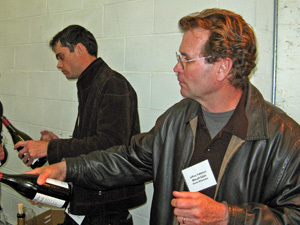 Both Duncan and Nathan were on hand to pour their wines. I’d tasted barrel samples of the Santa Cruz Mountains Chardonnay and Peter Martin Ray Vineyard Pinot last year, so it was interesting to see how they’ve developed. All of these wines can use some time in the cellar to show their best although of the three, the Watson Ranch Chard is most ready to go right now. Clendenen Family Vineyards 2008 Chardonnay, Le Bon Climat Vineyard, Santa Maria Valley. From an organically-farmed vineyard, wine aged two years in new oak. Light yellow color, bright and intense aromatics of apple and stone fruit plus spice and well-integrated vanilla/oak. Moderately rich and creamy on the palate, with lively acidity that gave this a citrus note in the mouth and finish. Very nice, and a good demonstration that bigger Chardonnays can be balanced as well as lighter, leaner ones. Clendenen Family Vineyards 2008 Pinot Noir, Le Bon Climat Vineyard, Santa Maria Valley. Entirely from 667 clone. Light garnet color, with tart red fruits, herbs, and earth on the nose. Smooth, rich mouthfeel but with moderately grippy tannins on the finish. Au Bon Climat 2010 Pinot Noir, “Isabelle,” California. Named for Jim Clendenen’s daughter, this wine is always a blend of ABC’s best barrels each year, from varying vineyard sources. Light ruby color, with ripe strawberry and raspberry fruit, earth, tea leaf, and a touch of sweet oak. Livelier mouthfeel than the previous wine, this had a silky texture with more refined tannins. Deserving of time in the cellar to let all the components integrate more. Au Bon Climat 2009 Pinot Noir, “Rosemary’s,” Talley Vineyard, Arroyo Grande Valley. From Brian Talley’s vineyard planted in 1987, 100% whole-cluster fermentation, aged two years in new oak. Light garnet color, this was less fruit-forward than the “Isabelle,” with tea leaf and dried herbs, spice, and earth leading the way and raspberry and cherry fruit and vanilla/oak in support. Moderately rich with medium tannins on the finish, nice. Comments: Au Bon Climat was founded in 1982 by Jim Clendenen and Adam Tolmach (who now heads up The Ojai Vineyard), and their winery is located at Bien Nacido Vineyard near Santa Maria. The Clendenen Family Vineyards label features wines from Le Bon Climat Vineyard, planted in 1998 and owned (not surprisingly!) by the Clendenen family. I got to the ABC table early and Jim Clendenen brought over a partial bottle of his Talley Vineyard “Rosemary’s” Pinot from the earlier seminar to add to the other wines being poured. I had been disappointed by the ABC wines at last year’s IPOB tasting but they poured some very good wines this year, particularly the Chardonnay – the richest Chard I tried at this year’s event but beautifully balanced and delicious. Calera 2011 Chardonnay, Mount Harlan. Whole-cluster pressed and aged for ten months in 30% new French oak. Very light color, with somewhat reserved citrus, earth, and spice aromas plus a touch of oak. In the mouth, a distinct chalky, minerally component came out and continued through the finish. Calera 2010 Pinot Noir, de Villiers Vineyard, Mount Harlan. This vineyard was planted in 1997. About 15% whole-cluster fermentation, aged for 16 months in 30% new French oak. Light garnet color, showing pure red fruits, dried herbs, a touch of sweet oak, and loads of spice. Medium weight on the palate with moderate tannins. Although this wine should age nicely, it should also drink well early on. Calera 2010 Pinot Noir, Ryan Vineyard, Mount Harlan. From the youngest and most densely-planted of the Calera estate vineyards on Mount Harlan, first planted in 1998. 100% whole-cluster fermentation, aged for 16 months in 30% new French oak. Medium-light ruby color, displaying strawberry and cherry fruit, fresh herbs, and minerals, with an evident but surprisingly well-integrated stemmy component. Big and structured, this shows great promise and will age for years. Comments: Josh Jensen first planted vines in the limestone soil of Mount Harlan in San Benito County in the 1970s, and his Pinots in particular have been among California’s most distinctive over the years. The vineyard ranges up to 2,500 feet in elevation and is organically-farmed. All of the wines are fermented with native yeast. Josh was pouring his wines at the tasting. The de Villiers Vineyard bottling always features less whole-cluster fermentation than the other estate Pinots, allowing for earlier drinking, while the 2010 Ryan was one of the most accessible young 100% whole-cluster Calera Pinots I can recall. Chanin 2011 Chardonnay, Los Alamos Vineyard, Santa Barbara County. Light straw color, this displayed apple, spice, and lees on the nose, plus a touch of fresh herbs. Bright and lively on the palate, with a crisp finish. Chanin 2011 Chardonnay, Bien Nacido Vineyard, Santa Maria Valley. Light color, with pear and white peach aromas along with earth, spice, and minerals. This had a rounder mouthfeel than the first wine but featured great acidity, with a clean, tingly finish, nice. Chanin 2011 Pinot Noir, Bien Nacido Vineyard, Santa Maria Valley. Fermented with about 60% whole clusters. Bright garnet color, with herb and earth aromas, red fruits, and dashes of black pepper and baking spices. Medium-bodied and structured, with moderate tannins. Rather tight at this point and needing more time, but the whole-cluster component is already integrated nicely. Comments: Chanin Wine Company was founded by Gavin Chanin in 2007. He has been making a single Chardonnay and Pinot from two Santa Barbara County vineyards each year. Current wines are sourced from Bien Nacido and Los Alamos vineyards, two of the oldest in the region. Chardonnays are whole-cluster pressed to tank but not settled before they’re racked to barrel and aged on the lees for up to 14 months. Unlike the Bien Nacido Pinot, the 2011 Los Alamos Pinot was entirely destemmed. Oak for all the wines is in the range of 10-20% new. Gavin poured his wines again at IPOB this year. I skipped tasting the 2011 Los Alamos Pinot Noir this time as I had tried it during a visit with Gavin at his new winery space in January. A good line-up of wines that will need some bottle age to show their best. Copain 2010 Chardonnay, Brosseau Vineyard, Chalone. From older Wente clone vines, whole-cluster pressed and aged in neutral oak. Very light color, this featured bright grapefruit, lemon, and spice on the nose. Medium-bodied with a fairly round texture and a minerally, chalky component on the finish, very distinctive. Copain 2010 Pinot Noir, “Les Voisins,” Anderson Valley. Sourced from Hein, Abel, Henneberg, Monument Tree and Kiser vineyards. Medium-light ruby color, showing herbal red fruits, earth, and a touch of spice. Lighter-bodied with lively acidity and fairly mild tannins. Copain 2010 Pinot Noir, Monument Tree Vineyard, Anderson Valley. Medium color, with riper, more intense fruit aromas plus fresh herbs, earth, and a minerally note. Medium weight and rounder on the palate, with more noticeable tannins on the finish. Copain 2010 Pinot Noir, “Kiser En Haut,” Anderson Valley. Medium ruby color, displaying a more distinct mineral component along with raspberry and cherry fruit, flowers, and an earthy, mushroomy note. Bigger body with more structure in the mouth than the Monument Tree bottling, this finished with refined tannins, quite nice. Comments: Wells Guthrie established Copain in 1999. He’s been making Pinot Noir since the beginning, with nearly all the vineyard sources coming from Anderson Valley. Recent vintages have shown a lighter hand than the early ones. All of the Pinots get about 15-20% whole-cluster fermentation. Chardonnay is a relatively new venture for Copain, with the first bottling coming in 2009 from the limestone soils of Brosseau Vineyard in the Chalone AVA. 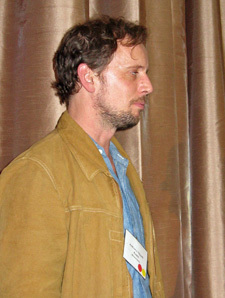 I missed seeing Wells when I stopped by the table but he was at the event. This was a strong group of wines from Copain. Drew 2011 Pinot Noir, Morning Dew Vineyard, Anderson Valley. From a vineyard in the “Deep End” of the valley nearest the coast, planted in 2001 by Burt Williams. Rochioli and DRC selections and 828 clone, 50% whole-cluster fermentation, 30% new oak. Medium-light garnet color, this had higher-toned strawberry and raspberry fruit, a floral note, earth, and herbs on the nose. Medium-bodied with bright acidity and moderate tannins, nice. Drew 2011 Pinot Noir, Weir Vineyard, Yorkville Highlands. Weir Vineyard is at higher elevation, planted in the 1990s. Rochioli and DRC selections and 2A clone, 30% whole-cluster fermentation, 25% new oak. Light garnet color, showing earthier aromas along with cranberry and strawberry fruit and a brushy note. Showing more weight and structure than the Morning Dew bottling, with a grippier tannic finish, this will need more time in the cellar. Drew 2011 Pinot Noir, “Gatekeepers,” Anderson Valley. Sourced from 55% Wiley Vineyard (30 year-old Pommard clone) and 45% Akin Vineyard (115 and 777 clones), 40% whole-cluster fermentation, 10% new oak. Slightly deeper ruby color, with black cherry, plum, fresh herbs, and lots of baking spice, plus a hint of flowers and a touch of pepper. Rounder mouthfeel and moderately rich, but displaying very lively acidity and a vibrant finish, very nice now but should age well too. Comments: Jason and Molly Drew launched Drew Family Cellars in Santa Barbara County in 2000, In 2004, they purchased a property on a 1,300-foot ridgetop west of Anderson Valley, and they’ve focused mostly on fruit sources from Mendocino County ever since. The Drews planted their own estate vineyard in 2011 with eight clones of Pinot Noir – they’re located only about three miles from the ocean in the Mendocino Ridge AVA. Pinots are fermented with varying amounts of whole clusters and are started with native yeasts, and are aged in French oak for 11-18 months. I had tasted the 2010 “Talfryn & Calder” Pinot last summer so I didn’t repeat it here. The “Gatekeepers” bottling features vineyards from each end of Anderson Valley. 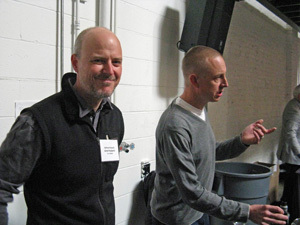 This was Drew’s first appearance at IPOB, and Jason poured his wines there. I thought his 2011 Pinots were standouts, a bit less fruit-forward than earlier vintages but featuring complex aromatics and bright acidity. Failla 2011 Chardonnay, Sonoma Coast. From younger vines, about 20% fermented and aged in concrete eggs and the rest in French oak, 15% new. Very light color, this featured bright apple, citrus, and spice with a slight mineral note. Medium-light bodied with a lively mouthfeel and finish. Failla 2011 Chardonnay, Haynes Vineyard, Coombsville. From Wente clones sourced from a vineyard planted in 1966. Barrel-fermented with 33% new oak. Light yellow color, with pear, stone fruit, and touches of citrus zest and vanilla/oak. Bigger and richer mouthfeel than the previous wine, with a clean, lively finish. Failla 2011 Pinot Noir, Sonoma Coast. Made from younger vines sourced from various vineyards, aged in about 20% new oak. Medium-light garnet color, shy aromas of red fruits, herbs, and earth. Lighter-bodied with a moderately lively mouthfeel and finish. Failla 2010 Pinot Noir, Hirsch Vineyard, Sonoma Coast. Pommard and Mt. Eden clones. Medium ruby color, displaying more intense strawberry, cherry, and rhubarb plus baking spice and a lightly floral note. Medium-bodied with good structure and moderate tannins on the finish. Failla 2011 Pinot Noir, Keefer Ranch, Russian River Valley. Destemmed, and aged in 33% new oak. Medium color, this showed black cherry, spice, and dried herb aromas, plus a touch of classic Russian River cola. Richer and rounder on the palate, with a more mouth-coating texture and refined tannins on the finish, nice. Comments: Originally called Failla Jordan, the winery was founded in 1998 by winemaker Ehren Jordan and his wife Anne-Marie Failla. Their first Pinot was a Keefer Ranch bottling from the 1999 vintage, and Chardonnay followed shortly afterwards. They first planted their estate vineyard in 1998 – it’s located on the far Sonoma Coast not far from Marcassin, Flowers, and Hirsch in the recently-designated Fort Ross-Seaview AVA. Pinot has been the core of the Failla production over the years, with bottlings continuing from Keefer Ranch and other cooler-climate sources, mostly from the Sonoma Coast. 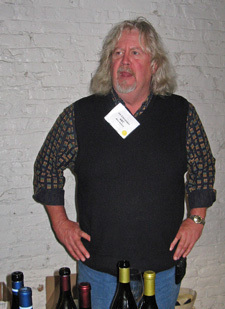 Ehren was on hand to pour his wines at the tasting, and the Keefer Ranch Pinot was my favorite of the wines he poured. Hirsch 2011 Chardonnay, Estate, Sonoma Coast. Light yellow color, displaying bright apple, nectarine, herb, and spice, plus undertones of sweet oak. Medium-light bodied with a lively texture and finish, nice. Hirsch 2011 Pinot Noir, “The Bohan Dillon,” Sonoma Coast. 30% estate younger vines plus 70% purchased fruit from neighboring vineyards. Light garnet color, with pretty floral red fruits, herbs, and earth. Medium-light bodied with bright acidity and mild tannins, a nice straightforward Sonoma Coast Pinot. Hirsch 2010 Pinot Noir, “San Andreas Fault,” Estate, Sonoma Coast. Sourced from 29 separate vineyard blocks, aged 18 months in 35% new oak. Medium-light color, this showed black cherry and plum fruit, plus more spice and a minerally component. More weight in the mouth than the previous wine, with moderate tannins. This seemed a bit closed and should benefit by more bottle age. Hirsch 2010 Pinot Noir, “Reserve,” Estate, Sonoma Coast. A barrel selection made from the most expressive barrels and aged longer in oak. Medium-light ruby color, featuring more intense strawberry and raspberry fruit, fresh herbs, earth, a hint of flowers, and a dash of sweet oak. Medium-bodied with more structure than the “San Andreas Fault” bottling, this turned more minerally on the palate, and finished with bigger but refined tannins. This will need time to develop but has lots of promise, should be very nice in a few years. Comments: David Hirsch was one of the wine pioneers of the western Sonoma Coast, first planting his vineyard only about three miles from the ocean in 1980. The vineyard, scattered among hillsides and ridgetops above the fog line, is planted mostly to Pinot Noir along with a little Chardonnay, with many of the current vines dating form the early 1990s. The vineyard is being converted to biodynamic farming. 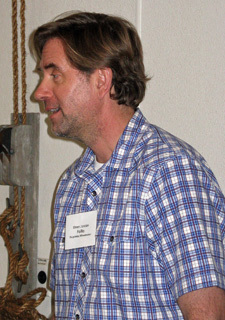 Ross Cobb has been making the wines since the 2010 vintage. Of course David’s daughter Jasmine Hirsch was at IPOB, but as one of the event founders/organizers, she was busy taking care of other matters when I stopped by the winery table. Hirsch poured a very good group of wines, all distinctive. Knez 2010 Chardonnay, Demuth Vineyard, Anderson Valley. Whole-cluster pressed, aged in 35% new oak. Very light straw color, with bright citrus, lemon zest, and spice on the nose. Bright and lively on the palate, with a long, clean finish, very nice. Knez 2010 Pinot Noir, Estate, Anderson Valley. Sourced from about 33% Demuth and 67% Cerise vineyards, with 40% whole-cluster fermentation and aged in 30% new oak. Medium-light ruby color, this showed red fruits, earth, and dried herb aromas, along with a touch of oak. Medium-light bodied with good structure, this finished with moderate tannins. Knez 2010 Pinot Noir, Demuth Vineyard, Anderson Valley. 50% whole-cluster fermentation. Slightly lighter color, displaying raspberry, earth, mushroom, and herb notes along with spice and a floral note. Medium-light bodied, with an elegant texture and refined tannins on the finish, nice. Knez 2010 Pinot Noir, Cerise Vineyard, Anderson Valley. Medium-light color, this featured riper black cherry and plum fruit, plus more spice on the nose. Bigger mouthfeel than the previous two wines, with more grip on the finish, a more masculine Pinot than the other two. Comments: Proprietor Peter Knez purchased both Cerise and Demuth vineyards a few years ago, and in 2009 he planted the new Knez Vineyard between the two. The hillside sites range from 700 to 1700 feet in elevation, above Boonville in Anderson Valley. Cerise Vineyard was planted in 1995 with ten Pinot clones, while Demuth was planted in 1982, with Wente clone Chardonnay and Pommard and Wädenswil Pinot clones. Farming of the vineyards is transitioning to biodynamic. The first vintage for the winery was in 2009, making it one of the newest producers at this year’s IPOB tasting. Anthill Farms’ Anthony Filiberti is the winemaker and was behind the table at the event. Although I’ve tasted wines made from both Cerise and Demuth vineyards many times in the past, this was my first time tasting the Knez wines. They presented a strong group of wines, and this is a new producer that should be worth watching in the future. Littorai 2010 Pinot Noir, Roman Vineyard, Anderson Valley. From the northwest end of Anderson Valley, above the town of Navarro. Medium-light ruby color, with black cherry and spice, earth, and undertones of oak. Medium-bodied and fairly lively, with a moderately tannic finish. Littorai 2010 Pinot Noir, Mays Canyon Vineyard, Russian River Valley. From a vineyard on the western edge of Russian River Valley, 10% whole-cluster fermentation, aged 16 months in 30% new oak. Medium ruby color, showing black cherry and plum fruit, a savory note, lots of spice, and a touch of vanilla/oak. A bit richer on the palate than the first wine, this finished with moderate tannins. Littorai 2010 Pinot Noir, The Haven Vineyard, Sonoma Coast. A mix of 12 Pinot clones, from a biodynamic vineyard planted in 2001 by Ted Lemon on a 1,200-foot high ridge near Occidental, made with 10% whole-cluster fermentation, aged 16 months in 30% new oak. Medium-light color, this was less fruit-forward, with more savory and earthy character along with plum and darker fruit, spice, and black pepper. Medium weight with more structure than the first two wines and grippier tannins on the finish. This is a complex young Pinot that should develop very well with time in the cellar. Comments: Littorai Wines was established by Ted and Heidi Lemon in 1993. Ted worked in Burgundy in the early 1980s, and became winemaker at Domaine Roulot for two years starting in 1983. The Lemons purchased property in 2003 between Sebastopol and Freestone and completed a gravity-flow winery built with straw-bale construction there in 2008. All of the Littorai vineyards are farmed organically or biodynamically – the estate Pivot Vineyard at the winery property is part of an overall biodynamic farm there. All of the Littorai wines are fermented with native yeast. The three Pinots were all distinctive, and I thought The Haven Vineyard bottling was a particular standout. Mount Eden 2010 Chardonnay, Estate, Santa Cruz Mountains. Barrel-fermented and aged in about 65% new oak. Light color, with apple and pear fruit along with earth, spice, and vanilla/oak. Medium-bodied with good acidity and a long, fairly smooth finish. Mount Eden 2007 Chardonnay, Estate, Santa Cruz Mountains. Barrel-fermented and aged in 50% new oak and 50% one year-old barrels. Slightly deeper yellow color, the aromas were more complex than the first wine, with citrus and stone fruit, spice, a mineral note, and a more-integrated oak note. The texture was rounder but quite lively, with a long, tasty finish, nice. Mount Eden 2010 Pinot Noir, Estate, Santa Cruz Mountains. Whole-cluster fermented, aged in 70% new oak. Medium-light ruby color, showing strawberry, plus tea leaf, minerals, earth, and undertones of sweet oak on the nose. Medium-light bodied with a bright mouthfeel and finish, nice now and should age well. Mount Eden 2007 Pinot Noir, Estate, Santa Cruz Mountains. Aged in 50% new oak. Medium-light garnet color, less fruit-forward than the 2010 bottling, with earth, herbs, spice, and a savory note along with raspberry and cherry fruit and a touch of vanilla/oak. Medium weight on the palate, this still had moderately grippy tannins. Comments: Mount Eden is one of California’s most historic vineyard sites, with a story that extends back to legendary vintners Paul Masson and Martin Ray. The vineyard at Mount Eden was replanted beginning in 1984 with a variety of Dijon and “heritage” clones, including some propagated from the original vines planted there. Chardonnays are whole-cluster pressed and barrel-fermented in new and one-year old French oak, where they are aged on the lees for ten months, then bottle-aged for two years. Pinots undergo native yeast fermentations in small lots, then go into mostly new oak along with some one-year old oak, and barrel-aged for about 18 months. Proprietor/winemaker Jeffrey Patterson was at the IPOB tasting along with assistant winemaker Sean Geoghegan, and they poured the estate Chardonnays and Pinots from both the 2007 and 2010 vintages, an interesting comparison. Native9 2009 Pinot Noir, Rancho Ontiveros Vineyard, Santa Maria Valley. 100% whole-cluster fermentation, 80% Swan selection, aged 15 months in 70% new oak. Medium ruby color, with plum and darker berry fruit, herbs, minerals, and a savory note, plus well-integrated oak in the background. Medium-bodied and lively, with a firmly tannic finish that will need some time in the cellar. More open and integrated than when I tasted this last year, starting to evolve into a very nice young Pinot. Native9 2010 Pinot Noir, Rancho Ontiveros Vineyard, Santa Maria Valley. About 80% whole-cluster fermentation, aged 11 months in 60% new oak, to be released this fall. Medium color, this displayed brighter black cherry and plum fruit, dried herbs, a savory/meaty component, baking spices, and an undercurrent of vanilla/oak. More structured in the mouth, with big, chewy tannins. This has promise but needs lots of time to develop in the bottle. Comments: Native9 Wines is the project of grower James Ontiveros – a ninth-generation Californian. The eight-acre vineyard in Santa Maria Valley was planted in 1997-2000 with a variety of Pinot clones, and the vineyard is farmed organically. Yields in the sandy vineyard site are low, generally around 1.25 tons per acre. The first release of Native9 Pinot Noir was in 2004, and the winemaker is Paul Wilkins. Typically a high percentage of whole clusters are used – often 100% – and fermentation is with native yeast. James was on hand to pour the wines at the tasting. These are often wines that need some years in the cellar to show their best, although I thought the 2009 had already developed quite a bit since when I tasted it at last year’s IPOB event. Ojai 2010 Chardonnay, Bien Nacido Vineyard, Santa Maria Valley. From 37 year-old vines, barrel-fermented with native yeasts in neutral barrels. Very light color, with bright citrusy aromas along with hints of pears, earth, and herbs. Medium-light bodied, with a lively texture and finish, nice. Ojai 2010 Chardonnay, Solomon Hills Vineyard, Santa Maria Valley. Light yellow color, showing riper stone fruit and pear, a creamy note, spice, and a touch of oak. Bigger and richer on the palate than the first wine, with a smoother finish. Ojai 2010 Pinot Noir, Kick-On Ranch, Santa Barbara County. From a vineyard in the western part of Los Alamos Valley. Medium-light ruby color, very herbal aromas, along with red fruits, baking spice, and earth. Medium weight in the mouth with moderate tannins. Ojai 2010 Pinot Noir, Bien Nacido Vineyard, Santa Maria Valley. Fruit was destemmed, fermented with native fermentation, and aged for 14 months in 30% new French oak. Medium ruby color, bright and intense black cherry, mineral, tea leaf, earth, and black pepper aromas, with a touch of sweet oak. Medium-bodied and lively on the palate with more structure than the Kick-On bottling, finishing with grippier tannins. Very good complexity and should age well, quite nice. Comments: Adam Tolmach launched his Ojai Vineyard label in 1983, and built a winery near the town of Ojai in Ventura County not long afterwards. Largely known for their Syrahs, Ojai has produced Chardonnay and Pinot Noir since the early 1990s. In fact, the Chardonnay and Pinot sourced from Bien Nacido Vineyard has come from the same blocks for 20 years. They’re being farmed organically now, and Adam has been fine-tuning things in recent years to help bring in ripe fruit at lower sugar levels than in his earlier wines. Solomon Hills Vineyard has Dijon clones of Chardonnay planted, while Kick-On ranch is a relatively new vineyard source. Adam poured his wines at IPOB again this year, and I thought both of the Bien Nacido wines were standouts. Peay 2011 Chardonnay, Sonoma Coast. Light color, with citrus and pear fruit, plus spice and undercurrents of vanilla/oak. Lighter-bodied with a fairly smooth texture and lively finish. Peay 2011 Pinot Noir, Savoy Vineyard, Anderson Valley. Medium-light ruby color, this displayed earth, mushrooms, and herbs upfront, with plum and darker fruit plus baking spice scents in support. Medium weight on the palate with a vibrant acidity and moderate tannins on the finish, very distinctive. Peay 2011 Pinot Noir, “Pomarium,” Estate, Sonoma Coast. Medium-light color, more fruit-forward aromas of strawberry and raspberry, plus a bigger spice component and earthy, herbal notes. Richer mouthfeel than the Savoy, but retaining lively acidity and finishing with grippier tannins. Comments: Peay Vineyard is located only about four miles from the ocean in the far northwest reaches of the Sonoma Coast AVA near the town of Annapolis. The Peay label is run by the husband-and-wife team of Nick Peay, who farms the vineyard, and Vanessa Wong, who makes the wine, and by Nick’s brother Andy, who handles the marketing and sales work, and who poured the wines at IPOB. The first estate plantings were in 1998, and currently include 34 acres of Pinot Noir and 7 acres of Chardonnay within the 51-acre vineyard, which is farmed organically. Many of the Peay wines are made entirely from estate fruit, though some include purchased fruit as well. Their crop was unusually small in the cool 2011 vintage, so they purchased Pinot Noir fruit from Savoy Vineyard in Anderson Valley that year – my favorite of the three Peay wines I tasted. Sandhi 2011 Chardonnay, Sanford & Benedict Vineyard, Sta. Rita Hills. From Mt. Eden clone vines planted in 1971, made in 25% new oak. Light color, with earth, apple and pear fruit, and lots of spice on the nose. Medium-bodied, this had a slight saline quality that came out in the mouth, along with a lively texture and long finish, nice. Sandhi 2011 Chardonnay, Rita’s Crown Vineyard, Sta. Rita Hills. From a younger higher-elevation site planted on diatomaceous soil. Slightly darker color than the first wine, this was featured more upfront and riper fruit aromas, with earth, minerals, spice, and oak in the background. Rounder in texture, with a smoother finish. Sandhi 2011 Pinot Noir, Wenzlau Vineyard, Sta. Rita Hills. 100% whole-cluster fermentation. Medium-light ruby color, displaying a stemmy character along with red fruits and earth. Medium weight with a fairly smooth mouthfeel and moderately tannic finish. Sandhi 2011 Pinot Noir, Sanford & Benedict Vineyard, Sta. Rita Hills. From Mt. Eden clone vines planted in 1971, made with 25% whole-cluster fermentation. Medium ruby color, with more intense raspberry and plum fruit, earth, and hints of flowers and baking spice. Livelier on the palate with bigger but more refined tannins. Sandhi 2011 Pinot Noir, “Evening Land-Tempest,” Sta. Rita Hills. From a high-density planting, made with 100% whole-cluster fermentation. Slightly darker color, this had a slightly stemmy quality but better-integrated than the Wenzlau bottling, along with darker berry fruit, spice, and forest floor elements. Bigger and more structured in the mouth, with grippier tannins on the finish. Comments: Sandhi is one of the newest producers at the IPOB event, having been established in 2010 by Rajat Parr, wine director for Michael Mina Restaurants (and IPOB co-founder), Charles Banks, former owner of Jonata and Screaming Eagle, and Sashi Moorman, winemaker for Stolpman, Evening Land, and his own Piedrasassi label. The first wines released were from the 2009 vintage, and nearly all of the winery’s fruit comes from the Sta. Rita Hills AVA. The climate and the diatomaceous soil found in part of that region were factors in choosing these vineyard sources. Chardonnays are crushed and pressed to tank, then racked straight to mostly older cooperage for fermentation and aging. Pinots are mostly fermented with whole clusters, and all of the wines are fermented with native yeast. Rajat poured his wines at the event, and as was the case last year, I preferred the Chardonnays to the Pinots Noirs. The Sanford & Benedict bottlings were my favorites of both the Chards and Pinots. Soliste 2010 Chardonnay, “L’Age D’Or,” Russian River Valley. Partial malolactic fermentation, aged for 16 months in 600-liter cooperage, about 18% new. Light color, this displayed pear and nectarine fruit, spice, and herbs, along with a minerally note. Medium weight and lively on the palate, with a bright, clean finish, nice. Soliste 2010 Pinot Noir, “Nouveau Monde,” Sonoma Coast. All Pommard clone from La Cruz Vineyard in the Petaluma Gap. Medium-light ruby color, showing red fruits, dried herbs, earth, and a floral note on the nose. Lighter-bodied with a fresh acidity and medium-light tannic finish. Soliste 2009 Pinot Noir, Sonatera Vineyard, Sonoma Coast. All 777 clone from the vineyard’s T Block. Medium color, with brighter and more upfront darker berry fruit, along with earth, lots of baking spice, and undertones of vanilla/oak. Bigger on the palate than the first Pinot, with a richer texture and finish. Soliste 2010 Pinot Noir, “Forêt,” Sonoma Coast. All 23 (Mariafeld) clone from a vineyard near Forestville. Medium-light ruby color, less fruit-forward than the Sonatera bottling with forest floor, earth, flowers, and spice along with plum and raspberry fruit. Medium-bodied with a lively mouthfeel and more grippy finish. Comments: Soliste is the label of family friends Elisabeth & Claude Koeberle and Beth & Donald Plumley. The first Soliste wine was from the 2005 vintage, a Pinot Noir from Sonatera Vineyard near Sebastopol, and most of their production has consisted of various bottlings of Pinot. As of 2010, Soliste has been producing two separate lots of Chardonnay, one aged in French oak and another aged in concrete “eggs.” They have not yet released the first concrete-aged version, to be called “Les Cailles.” The winery has registered a trademark for the name “MonoClone,” as their single-vineyard Pinot Noirs are all made exclusively from single clones that are felt to work best at each of the vineyard sites. This was my first experience with the Soliste wines, and they were very nice. I especially liked the Chardonnay, and the “Forêt” was my favorite of the three Pinots. Twomey 2010 Pinot Noir, Anderson Valley. From Ferrington, Savoy and Monument Tree vineyards, aged in 45% new and 55% one year-old oak. Medium-light ruby color, this featured earthy strawberry and raspberry fruit, tea leaf, spice, and vanilla/oak. Medium-bodied with a lively texture and finish. Twomey 2010 Pinot Noir, Russian River Valley. Fruit sourced from the estateWest Pin Vineyard and from Crinella Vineyard, aged in about 50% each new and one year-old barrels. Slightly darker garnet color, more fruit-forward scents of cherry and plum, plus earth, baking spice, and touches of cola and oak. Rounder mouthfeel than the Anderson Valley bottling, with more structure and tannin. Twomey 2010 Pinot Noir, Bien Nacido Vineyard, Santa Maria Valley. From various vineyard blocks, aged in 35% new and 65% one year-old oak. Medium ruby color, with a more herbal character along with red fruits and lots of spice. Moderately rich on the palate, this finished with fairly refined tannins. Comments: Raymond Twomey Duncan, who co-founded Silver Oak Cellars with Justin Meyer in the early 1970s, launched the Twomey label in 1999. Although the winery’s focus has largely been on Merlot, they purchased nine-acre West Pin Vineyard along Westside Road in Russian River Valley in 2000, and began producing Pinot Noir soon afterwards. They now make Pinot bottlings from the Sonoma Coast, Russian River Valley, Anderson Valley, and Bien Nacido Vineyard in Santa Maria Valley. Daniel Baron, Twomey’s director of winemaking, has been with the label from the start, and Ben Cane is the winemaker. Pinots are fermented with native yeast, and a small percentage of whole clusters may be included. The wines are barrel-aged for about 15 months in newer oak. I tasted three of the Twomey Pinots at the IPOB event, and the Anderson Valley bottling was my favorite of those. Tyler 2010 Pinot Noir, Clos Pepe Vineyard, Sta. Rita Hills. Medium ruby color, featuring bright plum and darker berry fruit, lots of earthy notes, spice, and a touch of oak on the nose. Medium-bodied, this had moderate tannins on the long finish. Perhaps a bit tight at this point but with the potential to age well. Comments: Justin Willett founded Tyler Winery in 2005, and he focuses exclusively on Chardonnay and Pinot Noir from Santa Barbara County. Vineyards for recent releases have included Bien Nacido and Dierberg in Santa Maria Valley, Clos Pepe, La Encantada, and Zotovich in the Sta. Rita Hills appellation, and Presidio, just west of Sta. Rita Hills. The Chardonnays are whole-cluster pressed to tank, and after fermentation starts there the juice is racked to about 20% new French oak. The wine is racked back to tank for the last few months prior to bottling. Justin typically will include a percentage of whole clusters for the Tyler Pinots, but the 2010 vintage Pinots were entirely destemmed. Pinots are aged for about 16-17 months in 20-30% new oak. I only sampled one Tyler wine at IPOB, since I had tasted the other wines being poured during a visit with Justin at his winery in January. During that visit, my favorites were the Clos Pepe Chardonnay and La Encantada Pinot Noir (neither of which were poured at IPOB), with the Bien Nacido N Block Pinot not far behind. Varner 2010 Chardonnay, “Amphitheater Block,” Santa Cruz Mountains. Sourced from 29-year old own-rooted Wente clone vines. Light color, featuring pear and nectarine fruit, plus touches of spice and herbs. Medium-bodied, this had a fairly smooth mouthfeel and finish. Varner 2010 Chardonnay, “Home Block,” Santa Cruz Mountains. From own-rooted 30 year-old clone 4 vines. Light straw color, with citrus, minerals, along with lemon zest and a slight saline quality on the nose. Somewhat richer mouthfeel than the first wine, but with more texture and structure, and a fresher, livelier finish, nice. Varner 2010 Chardonnay, “Bee Block,” Santa Cruz Mountains. From a selection massale block planted in 1987. Light yellow-straw color, this displayed riper stone fruit and tropical fruit aromas, and a more noticeable oak component. Rounder and richer than the other two Chards, with a long, smooth finish. Mountains. Light garnet color, showing higher-toned red fruit, earth, and lots of spice. Medium weight on the palate with lively acidity and relatively mild tannins. Neely 2009 Pinot Noir, “Picnic Block,” Santa Cruz Mountains. Medium-light color, more intense raspberry and cherry aromas, plus herbs, flowers, and a dash of oak. Bigger structure than the “Hidden Block” bottling, with more noticeable but nicely-refined tannins on the finish. Neely 2009 Pinot Noir, “Upper Picnic,” Santa Cruz Mountains. From own-rooted 777 clone vines. Medium-light garnet color, with higher-toned cherry, smoke, and spice on the nose, along with touches of earth and vanilla/oak. Bolder than the first two Pinots, this had a fairly smooth texture along with a bright finish. Comments: Twin brothers Jim and Bob Varner run the Varner and Neely labels, as well as the Foxglove label. They farm 14-acre Spring Ridge Vineyard in the Portola Valley area of the Santa Cruz Mountains, first planted in 1980 and owned by the Neely family. Originally planted to Chardonnay and Gewürztraminer, Pinot Noir was added in 1997, and the Gewürz was grafted over to more Pinot in 2006. The vineyard is broken up into a number of separate blocks, and it is farmed organically. Some of the vines are own-rooted. The Chardonnays are all barrel-fermented and aged for eight months in about 25% new French oak. Little or no whole clusters are included in the Pinot fermentations, and the Pinots are aged in 25-30% new oak. All fermentations take place with native yeast. 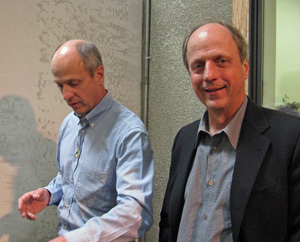 Both Bob and Jim poured their wines at IPOB, the winery’s first appearance there. My favorites were the “Home Block” Chardonnay and “Picnic Block” Pinot Noir. Wind Gap 2009 Chardonnay, “Yuen,” Central Coast. Sourced from 50% each James Berry and Brosseau vineyards, fermented entirely in concrete, and aged for 11 months in 50% stainless steel drums and 50% neutral oak. Very light color, this featured bright apple and pear fruit, spice, and mineral notes. Medium-light bodied with an interesting chalky texture and brisk acidity, distinctive and quite nice. Wind Gap 2011 Pinot Noir, Sonoma Coast. Sourced from Griffin's Lair, Gap’s Crown, and Black Night vineyards, fermented with 40% whole clusters, and aged for 10 months in neutral oak. Medium-light garnet color, with herbal red fruit aromas along with touches of earth, spice, and pepper. Medium weight on the palate with moderate tannins on the finish. Wind Gap 2011 Pinot Noir, Gap’s Crown Vineyard, Sonoma Coast. Made mostly in concrete “egg” tanks, with about 50% whole-cluster fermentation. More intense aromatics of darker berry fruit, tea leaf, and earth. More structured in the mouth, with a grippier tannic finish that will need some cellar time to smooth out. Comments: Wind Gap is the label of Pax and Pam Mahle, founded in 2006. The winery is moving into The Barlow, a complex of new and renovated buildings on the eastern edge of downtown Sebastopol. A number of the Wind Gap vineyard sources are from areas where coastal breezes help shape the growing season – the noted Petaluma Gap is just one example. Fermentations are with native yeast, and Pinots generally include a good deal of whole clusters. The fermentation and aging is done in various vessels – stainless steel, concrete, and older oak. Pax poured three of his latest wines at the IPOB tasting. The Wind Gap wines are always distinctive and different, and these were no exception. Both Pinots seemed very young and will need bottle age, but my favorite was the “Yuen” Chardonnay with its chalky, minerally character.